The patient will first be assessed according the inclusion and exclusion criteria in the outpatient clinic for candidacy of participation in the study. Patient will be informed by their surgeon about the possible candidacy and given the information leaflet about the study and a copy of the consent form for consideration. Patients have to undergo liver biopsy prior to surgery when abnormality of the liver parenchyma is suspected (history, imaging). If not already done outside, liver CT or MRI and PET CT will be performed and besides the extent and localization of the CRLM volumetrically assessed. Routine chemistry, hematology tests and tumor markers (CEA) will be ordered (if not already available). If cardiac optimization is necessary, the judgment about operability of the patient is up the consultant from cardiology. Renal dysfunction is no contraindication to undergo major liver surgery, however appropriate risk stratification and care by nephrology perioperatively have to be arranged. The patient should be discussed in the interdisciplinary tumor board. After candidacy has been agreed upon by the tumor board the patient will be seen by the PI or an investigator and the study will be discussed and any questions addressed. If the subject agrees to participate the consent form will be signed. Registration on a separate screening log will be performed. All preoperative tests should be performed within a month prior to surgery. An ICG test and HIDA-Scan will be performed before stage I (when available). The ICG test involves injected a dye (ICG) that will be metabolized by the liver. The dye signal will be picked up by an oxymetry-like device. This test is routinely performed in Zurich prior to major liver resections. Latest at this visit all preoperative investigations have to be completed. Fulfilling all inclusion and exclusion criteria the patient will be included in the study. After laparoscopic or open surgical exploration and liver biopsy, the patient is randomized. Exclusion of patients is possible after exploration and biopsy. Randomization will be performed by the PI or a designated deputy (investigator) using the randomization software implemented in the CRF database (Secutrial®) after exploration. This investigator responsible for randomization is in close contact with the surgical team assigning the subject in the ALPPS or the Two- Stage Hepatectomy group. This can be performed telephonically. In randomized patients the first surgical intervention will be performed according to practice of the respective center. In ALPPS, to avoid formation of adhesions only resorbable material should be used to cover the transsection surface (e.g. tachosil). In Two- Stage Hepatectomy, the procedure is either a cleaning of tumors from the FLR with simultaneous ligation of the portal vein of the contralateral lobe (PVL RES), or delayed catheter based portal vein embolization to induce hypertrophy in the contralateral lobe performed in the interventional radiology department about 1 weeks after FLR cleaning (RES PVE). Therefore, for RES PVE stage I starts with portal vein embolization (PVE) about 1 week after cleaning of the FLR. In the ALPPS arm stage II will be generally performed after appropriate hypertrophy has been obtained. The judgment of what is considered ‘appropriate hypertrophy’ will be left up to the centers. In Zurich a combined volumetric/functional assessment using cross sectional imaging and HIDA scan will be performed at week 1. If hypertrophy is not enough, CTs or MRIs will be performed at the same intervals as for the Two- Stage Hepatectomy group. The ALPPS stage II consists in ligation of the hepatic artery, transection of the biliary pedicle, transection of the hepatic vein and removal of the liver lobe. Pre- and postoperatively liver synthetic function, metabolic function and recording of complications will be performed. Patients having received PVL RES as stage I will generally proceed to discharge without stage II performed during the same admission. They generally reach appropriate liver volumes at week 4 or 8, maybe later. For these patients the liver volume is first volumetrically assessed 1 week after start of study participation. Repeated volumetry is necessary at 4 weeks, in case of a slow volume increase also after 8 and after that per decision of the respective center. If hypertrophy is judged appropriate stage II will be performed. Patients having received PVE about 1 week after a cleaning of the FLR lobe (RES PVE) will reach appropriate liver volumes comparable with the PVL RES group. If hypertrophy is judged appropriate stage II will be performed as described. Chemotherapy may be performed in both arms either after step 2 or between steps as thought appropriate by the treatment team since chemotherapy might play a role avoiding recurrence after two-step liver resections. In our experience initiation of chemotherapy is possible early after randomization in ALPPS but also between the two stages in conventional Two- Stage Hepatectomy (“interval chemotherapy”). 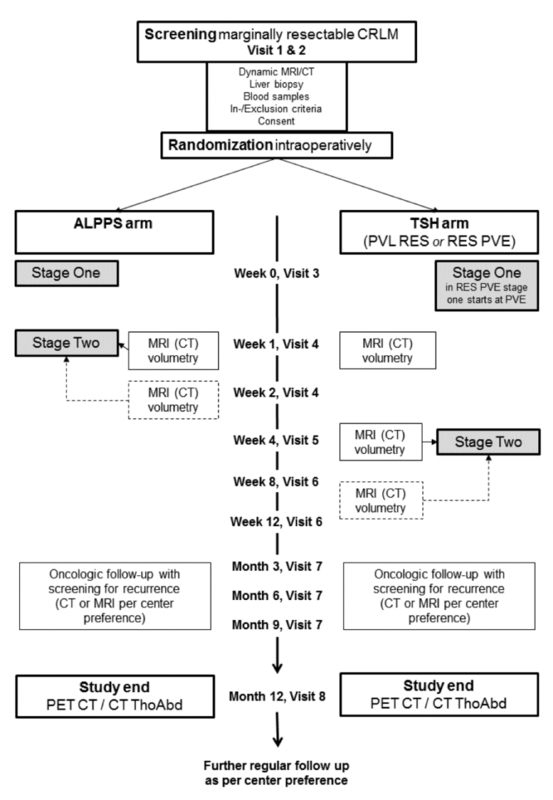 Subjects of the ALPPS and the Two- Stage Hepatectomy group (PVL RES and RES PVE) will be seen in the outpatient clinic week 4 after randomization for follow-up. Only the ALPPS arm will have completed both stages at week 4 after randomization. Routine physical examination will be performed, standard laboratory parameters obtained and perioperative adverse events will be recorded. Subjects of the ALPPS and the Two- Stage Hepatectomy group will be seen in the outpatient clinic at week 8 after randomization for follow-up. Routine physical examination will be performed, standard laboratory parameters obtained and perioperative adverse events will be recorded. If patients cannot undergo resection at week 8, later follow-ups should be performed per decision of the treatment team in monthly intervals. It may be decided to proceed to resection at any time during the entire follow-up period one year after randomization. Very likely chemotherapy will be reinitiated during that phase. Oncologic follow-up will be performed at month 3, 6 and 9 with screening for recurrence (CT, MRI per center preference). Study participation will end after 12 months. At 12 months patients will be invited to undergo full laboratory exam including tumor makers and a PET- CT (if not available CT Thorax Abdomen). The decision about which patients has achieved a state of “disease-free” will be solely based on the assessment of the PET-CT or CT Thorax abdomen by two blinded radiologists in the study center in Zurich. Controversial cases will be shown to a third blinded radiologist for final decision. Elevation of tumor markers along without PET evidence of disease will be classified as “disease free”. Repeat CT scans are allowed, if the centers wish to perform them in controversial situations. For long-term disease-free survival, follow up visits after study end will be performed after 18 months, 2, 3, 4, 5 and 10 years.